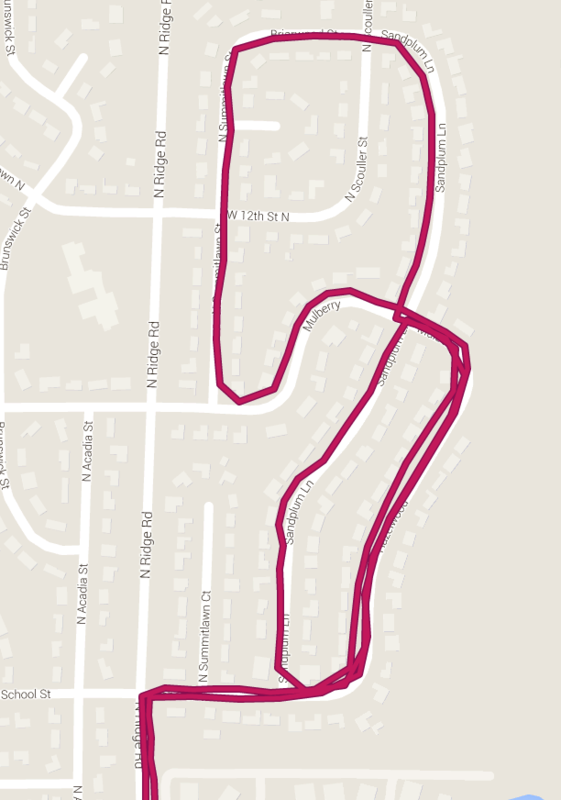 Since using MapMyWalk in 2009 to log a dog walk, I’ve been hooked on mapping my movement. I like knowing the number of miles I’ve clocked and looking back on all of the neighborhoods I’ve explored on the map. Over the years, I’ve used various iPhone apps and one by one they’ve fallen out of my favor for one reason or another. What they each had in common was the need to remember to start and stop the app at the beginning and end of a walk. There were countless walks in which a mile in I’d realize I’d forgotten to start the app. Or I’d forget to stop tracking after boarding a bus to go home and my map would be ruined because the app didn’t recognize that I was no longer walking. Immediately after realizing the Moves App would solve my start/stop tracking issue and that it would recognize the difference between walking, running, biking, and transport (bus, train, car, etc. ), I downloaded the app. I now have more than nine weeks of data and I’ll share with you how I’ve been using the app and the data made available. I should note that my personal experience is with the iPhone version but the app is also available for Android devices. Green (walking), pink (running), and blue (cycling) bubbles appear at the top of the screen and by tapping on the bubble, you can see your steps, miles, and time spent doing that activity. The size of the bubbles grows as you spend more time doing that activity. While the green walking bubble appears as a default and will show 0.0 miles at the start of the day, the running and cycling bubbles only appear after engaging in those activities. When you’ve achieved a personal best for an activity, “all-time record” displays over the bubble. In my opinion, the storyline is what sets Moves App apart and makes it much more than a pedometer. It is a diary of the places you’ve been and your mode of travel in between. In addition to walking, running, and cycling, it tracks transport. You can click on a place in your storyline to edit the location if it has “snapped” to the wrong location or is unknown. If a place you’ve been isn’t available, such as a friend’s house, you can create a custom label for the place. After you’ve assigned a place once, the app will recognize where you’ve been and automatically use that place name. In the example below, I walked a total of 10 miles throughout the day and took a 1.4 mile bike ride. I also edited the default “transport” to specify the bus, train, and car segments of my day. I’m including this long image to show an entire day of activity. You can select a segment of your storyline to drill down for more information. So, let’s say I take a sunrise walk by myself, then take a sunset walk with my husband. Before Moves App, all my walking data is in one lump sum. Now I can zoom in on the walk we took together to tell him the stats, including duration of the walk, start and end times, distance in both steps and miles, and average speed. How romantic! You can choose to receive notifications of all-time and past month records as well as daily and weekly summaries. For me, this has been motivating, especially now that I’m participating in 30Days of Biking and am accumulating cycling minutes and miles on Moves. In my opinion, one of the best features of the Moves App is the ability to export your data. With a click of a button you can download a zip folder containing the following file types: csv, geojson, georss, gpx, ical, json, kml, and kml_ge. I currently use the kml zip folder, which contains files for activities (walking, running, cycling, and transportation segments), places, and storyline. I have only used the activities files as imported layers on custom Google Maps. Map images for my walk recap blog posts including the Beer Walk: Wabasha Brewing Company for streets.mn. Map of the hikes and bike rides I take with my friend Julia as we log miles toward Department of Natural Resource’s 125 mile challenge. We will also test Moves App’s ability to track our boat miles when we hit the St. Croix in a kayak or canoe later this spring or summer. The app that Brian used to create a map summary of three weeks of movement is Move-O-Scope. After following a set of detailed instructions on how to connect the two apps, you can view a summary of your walking (green), running (pink), cycling (blue), and transportation (orange) on a map. It also displays places you’ve been as white circles. It’s easy to visualize where you spend most of your time as well as your most popular routes. Filter out the cycling routes I take in April for 30Days of Biking! Determine places I’d like to explore. Because I’ve only been using Moves App since the end of January 2016, there are huge gaps that I’m excited to fill in with green, pink, or blue lines. If you’re the kind of person who likes to track your activities throughout the day and you have an iPhone or Android phone, I recommend installing Moves App to help you visualize where you’ve been and how you got there. Then connect Moves App to Move-O-Scope and see your map glow in green, pink, blue, and orange. Additionally, the Moves App does take a decent amount of battery power (15% in the last 24 hours for me). I’m OK with this and charge my phone every night and have a phone charging case with me most of the time. For me, the pros outweigh the cons and I’m hopeful the app will stick around long enough for me to celebrate walking every street in Minneapolis (and maybe St. Paul too!). Do you currently track your activity? Yes? What do use and what do you like about it? How do you think tracking your activity changes the way you interact with your environment? Has activity tracking changed your behavior? I think I saw that same tweet from Brian and downloaded Moves as a result, but I hadn’t figured out how to make a similar map, so thanks! How do you actually get to the map once the app is connected? Erik, I wish I could help you but I’m having a hard time remember what it was like during initial set-up. I did find moveoscope to be a bit clunky when I initially set it up. If I have time I’ll add a video link of the steps. Feel free to connect with me on Twitter at @janellie23 and I’ll try to walk you through it. If you go to app.moveoscope.com (easiest on a desktop), click on Connect My Moves and a PIN number will pop up. Enter that number in on the Moves app in iOS (click the M in the lower corner, Connected Apps, Enter PIN). Once you do that, the web app will refresh and you can view your map. Then just keep that link handy and you can refresh your data whenever you want to! Some of us prefer not to be reminded of where we’ve been or been doing. Thanks, Janelle! I feel as though I’m missing one step where it’s supposed to autoredirect. I’ll DM you. One of the other features on Moves that I really like is if you gesture down from the Today screen, you can get a daily and weekly view of your activity, represented by Green (walking) and Blue (biking) dots. It’s a fairly easy way to see how many miles you’ve went in that period. The other way I use Moves is to check back on a map to see where I went. A few weeks ago I was down in KC and did a lot of driving around. Now I can look at my map and see exactly where I was in town. Could be useful. Oh yes, thanks for the reminder! I knew I was missing one of the views of data on the app itself. Thanks again for leading me to this app Brian. I also like your idea of using the map to review places you’ve been in other cities. Oh, and the primary reason I started digging into Moves and the Connected Apps was because I really wanted to create Heat Map like Strava does for Premium Users, but I didn’t want to pay the monthly charge mostly just for that feature. This is exactly what I’ve wanted out of the gps/motion features of my iPhone. Little interest in calorie burning, I want to see where I go on a map. Glad you mentioned the Facebook angle, I hesitated about a dozen times over that. I hope to find something else that lets me visualize my routes like move-o-scope without the looming Facebook harvesting… ? I have an Apple Watch, I mostly use it for notifications, calling with Siri, and Apple Pay. The only tracking I pay attention to out of it is the stand reminders. Eric, have you tried other apps? As Brian (Moe) indicated above, Strava Premium may offer you what you need as you can create heat maps. Also, Mike Sonn made me aware of https://www.madewithsisu.com/ after I posted this. It connects to Strava and Runkeeper accounts. I admit I haven’t researched if there is a fee. I think we’re all adjusting to and figuring out “free” vs. paid applications. Free in quotes because of aforementioned discussion of data and Facebook. Talented web developers and designers make these products and services so I want to support them. Aha! With https://www.madewithsisu.com one can purchase a print of your routes or rides/runs clocked. It’d be cool to get a years worth of data and celebrate with a poster. I’m going to keep looking, and I admit I haven’t looked thoroughly. I far prefer paid apps to free because I have seen apps come and go. I want to see good apps stay and good apps be rewarded. I’m even happy to pay subscriptions! The Spot emergency device that I got for solo wilderness treks can function in this manner but maybe not with sufficient detail for urban use. I’ve never used it in that mode, for fear of depleting the batteries (and no desire to carry the extra weight of a solar charger). David, I’d love to hear more about your solo wilderness treks! Janelle, I can be reached at davidbmarkle@yahoo.com. I have some good pictures, including some six foot wide prints. I also had a Garmin gps that would make a record, though not in high detail, and I got rid of it because it didn’t give accurate coordinates at high altitudes. If you have a Google account and an Android phone, the good people at Google are tracking your movements already on Google Timeline. Might not be granular enough for what you’re doing though. I think you have to opt-in, but I won’t swear to it. That seems like a great option! I sure like the idea of this app, but not if it’s owned by Facebook, whom I don’t trust with my personal data. I’d gladly pay a modest monthly fee to use an app like this with greater safeguards of my data (as required by law in Europe), but of course they won’t offer that as an option. I totally understand that point of view. It’s a good thing it’s currently opt in when we carry smart phones with us everywhere we go! FWIW, I’ve been using Strava for my (admittedly very infrequent) rides and hikes.